No matter what your stance is on climate change, the consequences of rising average temperatures have already been set in motion. Check out your region of the U.S. to see what’s at stake. Average annual temperatures in the northwestern United States have risen 1.5°F in the last century, with some areas up 4°F. That number is expected to keep increasing, with temperatures projected to be 3-10°F warmer by the end of the century. Higher temperatures and summer moisture deficits in soil would increase the risk of forest fires in a region already prone to them. 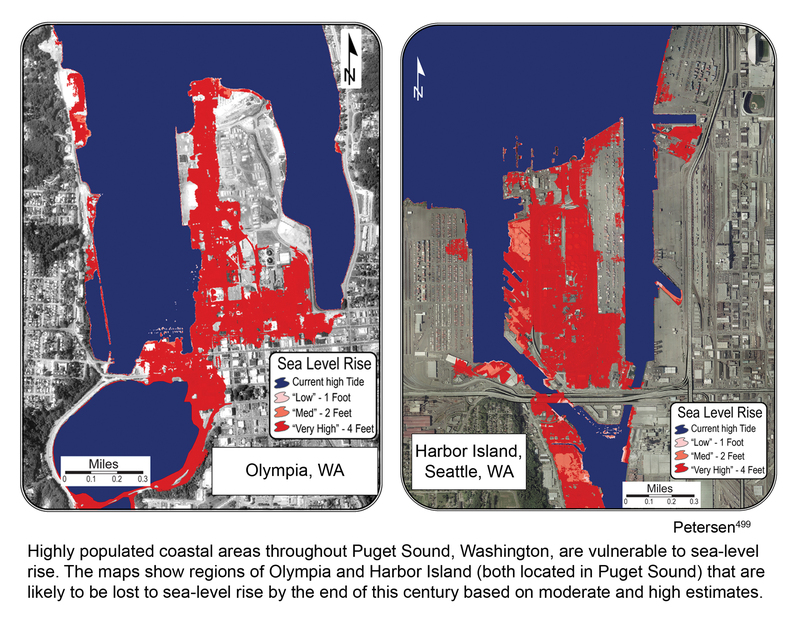 Climate change would further stress coastal regions as erosion from rising sea levels wash away beaches, particularly in vulnerable areas like the south Puget Sound, which includes Seattle, Tacoma and Olympia, Wash. The region’s sea level is estimated to rise about 13 inches by 2100, with up to 50 inches in some rapidly-sinking areas. Home to approximately 50 million people, the Southwest has seen its population increasing rapidly—with some states doubling the national growth rate of 9.7%. The demand for water resources, coupled with rising temperatures and reduced rain and snowfall in spring months, is likely to bring future water shortages. The single largest use for water in the region is agriculture, which provides nearly $45 billion in revenue to California – home of the nation’s biggest agriculture industry. The Central Valley produces a significant portion of food for the rest of the country, and crop failures from rising temperatures and water shortages may directly affect the food supply and consumer prices. The climate in the Great Plains region varies greatly—generally colder in the north, hotter in the south, semi-arid in the west and wetter in the east. The north usually experiences bitter winters, but in the last 30 years, it has seen a 7°F increase from average historical temperatures. Year-round temperatures are projected to continue rising, and precipitation patterns are also slated to change—becoming wetter in the north and drier in the south. More than 70% of the region is used for agriculture, including wheat, hay, corn, barley, cattle and cotton. Current water use is unsustainable, and because of the projected changes in climate and more frequent extreme weather events like droughts and heat waves, the region’s threatened water resources will become increasingly scarce for essential usage like agriculture. The Midwest’s Great Lakes contain 84% of North America’s surface freshwater and support the area’s transportation and commerce. With the projected rising temperatures, evaporation could reduce the lakes’ water levels by 1 to 2 feet by the end of the century. Although having longer ice-free seasons might positively impact shipping in the short-term, it could place stress on infrastructure and be detrimental to coastal ecosystems. Under a higher emissions scenario, plants typically grown in the Southeast could become established in the Midwest by 2100. Plant winter hardiness zones could shift with the increasing temperatures and lengthened growing seasons. Each zone represents a 10°F change in minimum temperature for growth. Some crop yields will likely increase with the warm temperatures, but this will also include escalating numbers of pests and invasive weeds. Along with higher temperatures, snow seasons in the Northeast are projected to be cut in half—even reduced to a few weeks in some regions. By the end of the century, the summers in New Hampshire could reach the same temperatures as North Carolina’s current summers. This is likely to have negative impacts on public health, given the poor air quality in many Northeastern cities, which are less adapted to dealing with the heat. With a projected increase in heavy precipitation and sea-level rise from ocean warming and ice sheet melt, the Northeast could see more frequent, damaging floods. The large coastal cities and dense populations are at risk for significant losses. In New York City, the water level in flood zones could increase as much as 31 inches by 2050. Although the Southeast already experiences warm temperatures, average annual temperatures are projected to increase 6–9°F by 2080. At these rates, northern Florida could experience more than six months at temperatures higher than 90°F by 2100. The high temperatures are likely to increase heat-repeated deaths and negatively affect public health. In addition, agriculture and urban environments could suffer from the projected droughts and strain on water resources. Satellite data show that sea levels along the coast have risen 3–3.5 mm per year since the 1990s, which is almost double the average rate during the 20th century. Extreme tropical weather events and coastal erosion are likely to increase as the sea level rises. This will threaten both urban environments along the coast and natural habitats, such as marshes and fisheries. Permafrost, the frozen ground one to two feet below the surface in cold regions, has risen in temperature throughout Alaska since the 1970s, with the largest increases in northern areas. About 14% of Alaskans live in areas susceptible to permafrost degradation, which affects highways, airstrips, buildings and other infrastructure. It is estimated that thawing permafrost can add between $5.6 billion and $7.6 billion to future costs for publicly-owned infrastructure by 2080. As the frequency and strength of strong storms and flooding are projected to increase, Hawaiian infrastructure and coasts will become progressively more vulnerable. Extreme sea-level days, more than 6 inches above the long-term average, are becoming more common. This affects coastal settlements, agriculture, marine life, fresh water supply and tourism, which generates more than $12 billion for Hawaii every year. For more on Earth Week, go to http://www.msnbc.com/earth-week. Quiz: What's Chelsea Clinton's announcement?